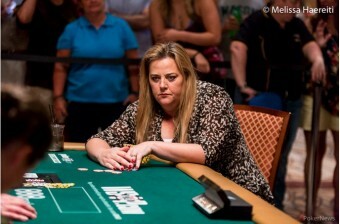 Congrats to Deborah Worley-Roberts, runner-up in the WSOP Ladies Championship for a lifetime best cash of $83,459. The fantastic performance takes her total live tournament winnings over the $200k mark and was by far her biggest cash; her previous best was fifth at the UK & Ireland Poker Tour Dublin event in 2013 for €14,780. Her best cash at the World Series was 181st place in a $2,500 NL tourney the same year for $6,442. The UK-based American was beaten heads-up by Australian Heidi May who won $135,098 and her first ever World Series gold bracelet. The $1k tourney drew a total of 718 entries creating a prize pool of $646,200. Debs, known as “Debs the Destroyer”, is American but lives in Hove next to the popular seaside town of Brighton on the UK South coast. She was being cheered on in the Amazon Gold room at the Rio by a very vocal and supportive rail. A large group of UK-based players took part in the Ladies Championship including Sin Melin, Unibet Ambassador Daiva Byrne, partypoker’s Charlie Godwin and Hippodrome ambassador Kelly Saxby. PokerNews dubbed Debs “a fan favourite” and WSOP Main Event players said they could hear the chant of “Debs the Destroyer” right across the room during the heads-up. Among those who cashed were three-time bracelet winner Vanessa Selbst who bust in 56th place ($2,040), WPT Anchor Lynn Gilmartin who finished 49th and Sweden’s Diana Svensk 48th – both for £2,301. British player Sonia Padovani was 55th for £2,040.